The path of the new Portland-Milwaukie Light Rail Transit Project impacted two companies in the North Milwaukie Industrial Area that ultimately relocated to make room for the new light rail tracks. Because of the complicated business environment faced by Beaver Heat Treating (BHT), TriMet began meeting with the company in 2008. Over the following several years TriMet and BHT reached an agreement with the company to help it move to a new site or fairly compensate it if could not successfully relocate. 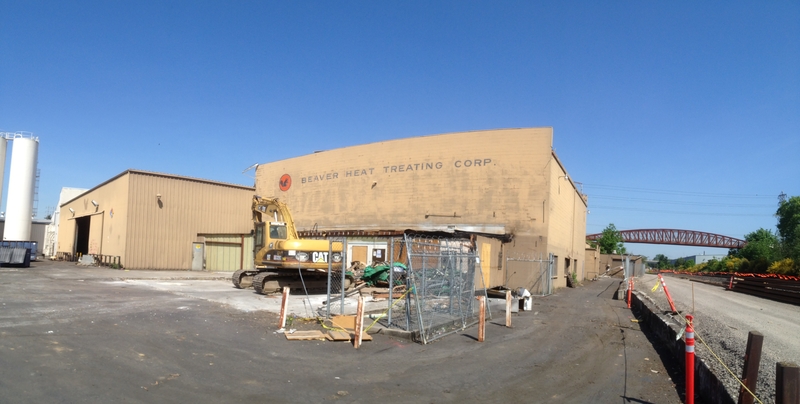 BHT closed down its heat treating business in March 2013 after more than 50 years operating in Milwaukie. However, the management and owners of the company were determined to see the former operations continue; a new company has emerged with the same leadership, the same employees, a new name, larger facilities and the potential for growth in the years ahead. Metal and steel manufacturers in the Pacific Northwest have, for decades, relied on BHT’s services. When it became clear that BHT would be closing, the company’s owners sought a way to continue to serve their customers and to maintain jobs for their workforce. In April 2013, some of BHT’s former owners created a new company, Thermal Modification Technologies Inc., to continue BHT’s legacy of providing high quality heat treating services and family wage jobs. The former Milwaukie facility was constrained at approximately 32,000 sq. ft. With more than 53,000 sq. ft. of space in the new Tualatin facility, TMT has room to grow as business is expected to expand over the next few years. The new company invested in state-of-the-art replacement equipment that is more efficient and environmentally friendly. The company also managed to make sure that no employees lost their jobs because of the move. The company averages about 40 full-time employees and projects that it could hire additional personnel in the years ahead. The other good news is that while it was estimated to cost between $13 million to $18 million to relocate the company, it actually cost $12 million. “While we would have never chosen to move our operations if we didn’t have to, a new company has emerged with expanded capacity, upgraded equipment, and is better positioned than ever to serve the heat treating needs in the Northwest, and to expand and hire more workers in the future,” said Karen Tobin, President of TMT. It took more than 5 years to come up with a solution for this unique business, and it’s encouraging that the operations at the new company are now even stronger, more robust, and ready for the future. At the end of May, the former BHT site was demolished to make way for the light rail project. The other North Milwaukie Industrial Area company that had to relocate because of the project routing was TOMRA, formerly Oregon Cans and Bottles. TOMRA is a global resource recycling company based in Norway. The Oregon division designs and manufactures machines for redeeming deposits on cans and bottles. TOMRA relocated to the Northwest Portland industrial area, and with the move, was able to improve its facilities. Federal and state laws protect property owners to ensure just compensation when a public works project impacts their property. It can take anywhere from 9 to 36 months or longer to acquire a property. TriMet strives to be a good neighbor and do the right thing with property owners and tenants. TriMet also partners with Portland State University to help link businesses with available business support services throughout the region. This includes reviewing and developing business plans, assisting with finding a new location, planning the move and planning the new work space. While the process can be challenging, many property owners and businesses are better positioned for future success as a result of the project and the support TriMet and its partners provide during the property acquisition and business relocation process.